SPECIAL!! This meeting only. Non-members pay the same as regular members! 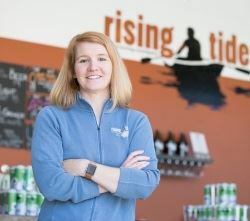 "Rising Tide: The Issues and Opportunities of Growing in Maine"
Something new! Something different for ACE! Road trip and social event. We are off to Rising Tide Brewing Company in Portland. Intent on keeping members (and guests) up to date on Maine's entrepreneurial successes, while also sipping a "cold one," ACE's May program will be held at 4:30-6 p.m. on Thursday, May 17, at Rising Tide Brewing Company, 103 Fox Street, Portland, not far from Whole Foods. We'll have a tasting and a tour, and co-owner Heather Sanborn will brief us at 4:45 on the phenomenal growth of Maine microbrews. After earning a master’s degree in teaching and then a law degree, Heather never expected to be running a brewery. But she has jumped on board with a level of excitement that has buoyed Rising Tide from its very inception. From financial projections to supply chains and tasting room operations, Heather pulls a laboring oar in nearly every aspect of the brewery operations. Heather is currently serving in the Maine House of Representatives and is past-president of the Maine Brewers’ Guild. She is a candidate for the open seat in Maine Senate District 28. Registrations (and registration cancellations) are required by May14th.